Objects of beauty are esteemed in Italy, whether it be in wondrous art, architecture, or the clean cut of an elegant suit. Fope’s necklaces fit the bill. Designed to enhance the natural beauty of a wearer, these sumptuous creations are feats of engineering and exquisiteness. Fope uses its patented Flex'it technology to create woven gold necklaces that are flexible, smooth, and yet incredibly durable. 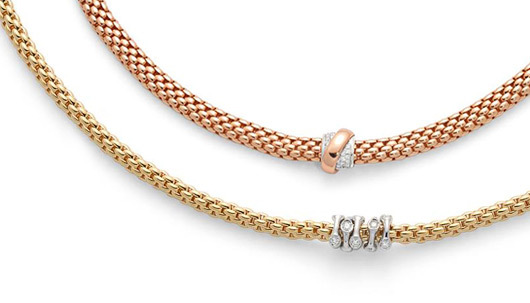 Necklaces in the Classic Mesh collection come in your choice of 18kt white, yellow, or rose-toned gold. These designs are elegant with or without a pendant. The addition of diamonds to the Flex’It Solo or Vendome variations brings an added flourish to an already beguiling design. Pave diamond rondels move fluidly along the chain in the Eka Collections. Lastly, the pieces from the Link Collections are basic staples that look superb with a classic white shirt or little black dress. All are equally spectacular and marvelous for any wardrobe.